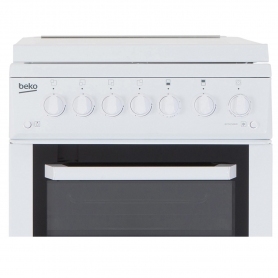 We all want flexible cooking at home, and the twin cavity BCDG504W from Beko allows for just that. 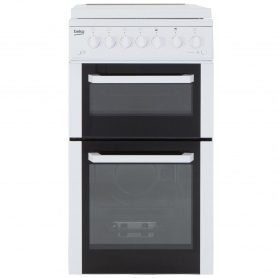 A main oven and separate grill, alongside a four zone hob, mean this gas cooker lets you whip up all your tasty food at once. 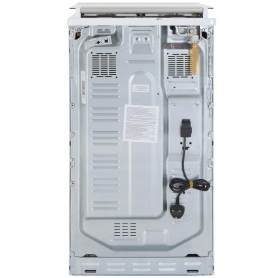 Beko have made the BCDG504W extremely convenient. A freestanding design allows you to position this appliance anywhere you want in the kitchen, so pick the right spot for you. Cooking a large meal and running out of surface space? 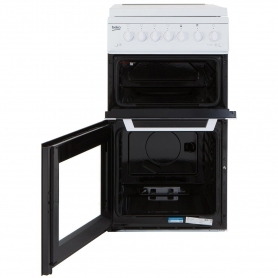 The BCDG504W hob comes with a lid, giving you more space to work when not in use. Simply lower it to have another surface for peeling, slicing and dicing. 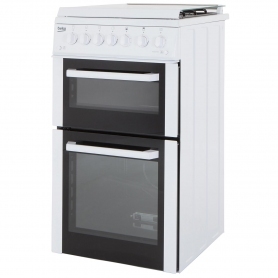 The large, 61 litre oven can accommodate plenty of food over its two shelves, allowing you to cook multiple dishes at the same time. Want to grill some bacon while the main oven’s in use? No problem – this twin cavity appliance keeps the grill separate, letting you use two cooking techniques simultaneously. With a grill pan and handle included, nothing will stop you whipping up some tasty bacon, chops or a delicious steak. Have up to four pots and pans on the go at once on the hob. Boil, steam and fry your way to culinary perfection with the four powerful gas burners. Inside the main cavity, an internal light helps you keep an eye on everything, helping you judge cooking times. Tired of scrubbing away at your old cooker? 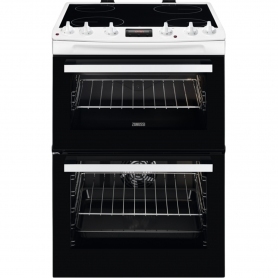 The BCDG504W has an enamel lining in both the oven and grill, which makes cleaning a breeze. Simply give it a quick wipe down to remove any cooking debris. The transparent glass door is double glazed, which helps keep heat inside the appliance and cuts down on waste. This has helped contribute to the BCDG504W’s A+ energy efficiency rating, meaning this Beko appliance is easier on your wallet and the environment. Should one of the hob’s burners accidently go out, the Flame Safety Device kicks in, shutting off the supply of gas and keeping you safe. 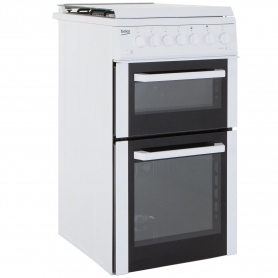 Pop the Beko BCDG504W in your shopping basket today, for a cooker that gives you flexibility and control.